Nicholas makes highly functional, uniquely handmade objects for use. The reductive minimal aesthetic found in his work is abstracted from his appreciation for all things precisely done with style. 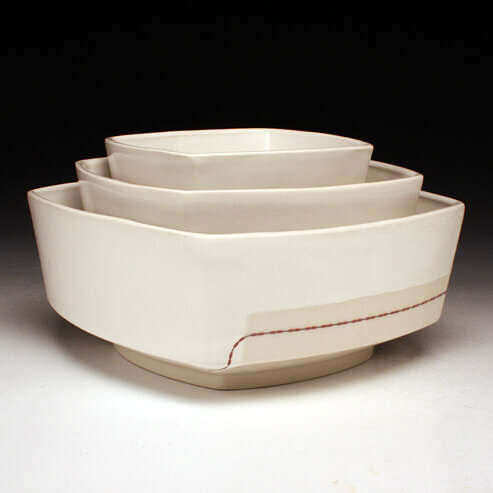 The ceramic pieces are high-fire slip cast porcelain with glaze and decals; the trays the pots rest upon are CNC-milled MDF, with automotive paint and rubber. Originally from the California Bay Area, Nicholas has received degrees from the University of Washington (B.F.A., B.A.) and Ohio University (M.F.A.). He has been an artist-in-residence at Red Lodge Clay Center and is currently a long-tem resident at the Archie Bray Foundation in Helena, Montana where he received the Matsutani Fellowship. He has recently been selected as an 2012 NCECA Emerging Artist for the conference held in Seattle. I make utilitarian wares using a precise, minimal, and efficient geometric language that nourishes my focused interest in defining perfectly handmade. It is the fascination with this seemingly paradoxical concept that propels me daily to practice my craft in a way that searches for a satisfying balance between how much evidence of handwork I put in, and how much evidence I take out. My approach to making objects is greatly influenced by my experience in athletics. Repetition, reduction, and precision are methodologies I once used in sports that now enrich my aesthetic sensibility. Working within this athletic model for physical conditioning, the repetitive process of making my work leaves my hands with a muscle memory that cannot be achieved in any other way. The end result of this approach to process are pots that are athletically defined themselves – reduced to only the necessary elements through significant repetition. I allow the process and the nature of the medium itself to determine the degree of tension between perfect and handmade in my work. The limitations inherent in the physics and chemistry of ceramics simultaneously restrict and expand my practice. My challenge then becomes the exploration of how far I can push the medium within those limits, while also pushing my own boundaries in form, surface, utility and overall design. In keeping a rhythm that is informed by my knowledge of ceramic process, I establish a balancing act that satisfies my desire for tightness and precision with my requirements for development and productivity. When an individual uses my work, the simultaneous attention of the user on the objects and the objects on the user reveal the unique nature of personal production for personal use. Pots that require the viewersâ€™ attention while at the same time allowing them to enjoy the experience of nourishment enrich the otherwise mundane act of use. This perpetual shifting in focus shows that through function, the object holds power in its passive waiting for an active participant. This precise collaboration with the viewer/user then allows a more conscientious operation, thus presenting questions about what occurs when the perceived traditional definition of handmade is denied, the ambiguity of perfection, and the vast different roles that objects can play in our lives.